Introducing the Northern Co-Hort, a new division of the Northern Environmental Action Team (NEAT)! We are dedicated to engaging our regional horticulture and agriculture producers to determine what supports are needed to generate a sustainable community of land users in the north! 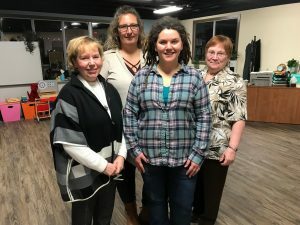 The Northern Co-Hort team consists of program coordinator Bess Legault and three research assistants, Sonya Runacres, Olivia Tremblay and Theresa White. With diverse backgrounds in horticulture & agriculture production and customer service we are here to listen to our regional producers so that we can develop meaningful programming to support our regional producers to succeed with their farm business. Northern Co-Hort Team (Left to right) Sonya Runacres, Olivia Tremblay, Bess Legault and Theresa White.